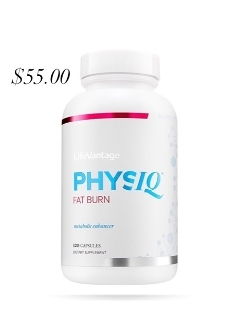 PhysIQ Fat Burn has one mission: to wake up your body’s metabolism with two naturally-derived fat burners so you can look and feel your absolute best. And it’s very good at what it does. Lets all take a moment to mourn the days when we could binge on chips and soda just to rinse and repeat the next day… (Sigh). As we age, our metabolism slows down. And that’s why trimming unwanted fat isn’t easy. PhysIQ Fat Burn is scientifically engineered with Sinetrol® and Svetol® --two naturally derived fat burners that stimulate the breakdown of fat and support long-term weight management. In other words, the fat goes down, while your results go up. PhysIQ Fat Burn is both natural and powerful. With the right diet and exercise, it can help you finally trim stubborn inches along with a whole lot more.